Barfi Ka Paratha or Sweet Paratha recipe is a new and innovative preparation of Indian roti using barfi. A yummy sweet delight for all Indians. Mash barfi pcs and mix the nuts to prepare the stuffing for the paratha. Roll out 2 chapati and stuff the barfi inside the rotis. Roll the paratha smoothly using dry flour, if required. 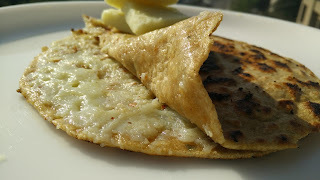 Place the paratha on hot griddle/ tawa and cook the paratha by applying oil on both sides, till crisp. Serve hot.